Lapland Lake Nordic Vacation Center is the Perfect Destination! Here are some reasons why you should have your special event at Lapland Lake: private sandy beach, 70 acre motor free lake, peaceful rest and relaxation, great hiking, plenty of space for outdoor fun. Summer is great a time for family reunions. If you’re planning on having dozens of extended family members and friends come together, we invite you to schedule your next family reunion here at Lapland Lake. We have activities and amenities for everyone. Whether your reunion attendees are very active or they just love to relax in the shade. We offer 10 cozy Adirondack rental cabins nestled throughout our wooded property. All lodging guests get complimentary use of our beach and swimming facilities, canoes, kayaks and rowboats. Guests may also enjoy our hiking trail network, volleyball/badminton and horseshoes, or our authentic Finnish wood burning sauna. Save money on meals by preparing your own. Have an epic pot luck or family BBQ. All cabins have charcoal grills and fully equipped kitchens, and we have a 32 hamburger rated charcoal barrel grill available for large groups. If you would like to leave some of the cooking to others, we can refer you to local caterers and tent rental services. Previous groups have set up a party tent on the lawn by Lapin tupa and had catered wood fired pizza prepared fresh on-site. For a night out; there are a number of great local restaurants for having a group meal off site. Evening Campfires are another popular activity at Lapland Lake. Each cottage has a fully stocked outdoor firepit. We can also schedule a group campfire at the pond by Lapin tupa or at the lakefront. What fun to roast marshmallows, make s’mores, sing, or tell ghost stories around the fire under a star studded night sky. Discounted rates are available for group rentals. Discounts are off standard rates and rental must include the four bedroom Lapin farmhouse. Single invoice required; Not all dates qualify. Call 518-863-4974 for availability and details. We are currently taking reservations for 2019 dates. 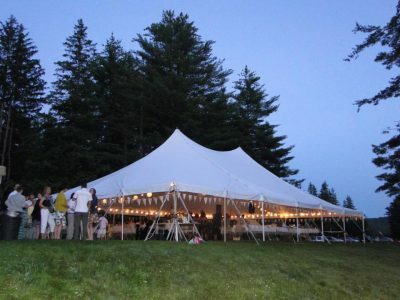 Weddings may be hosted during the spring, early summer, and fall seasons at Lapland Lake. If you are seeking a natural and simple yet uniquely beautiful setting for your wedding, please contact us and we will be happy to arrange an on-site visit. Wedding packages include 2 nights lodging for 50 guests in 10 tupas (housekeeping cottages). Our location is best suited to gatherings of 75 or fewer. Maximum lodging occupancy is 68. More information regarding weddings at Lapland Lake can be found here. or call us at 518-863-4974.